Dog lovers can look forward to a record-breaking 14 hours of television coverage when Crufts returns to Channel 4 and More4 this March to celebrate the world’s largest dog show. This is two and a half hours more than the 2017 show which was then a record in itself. 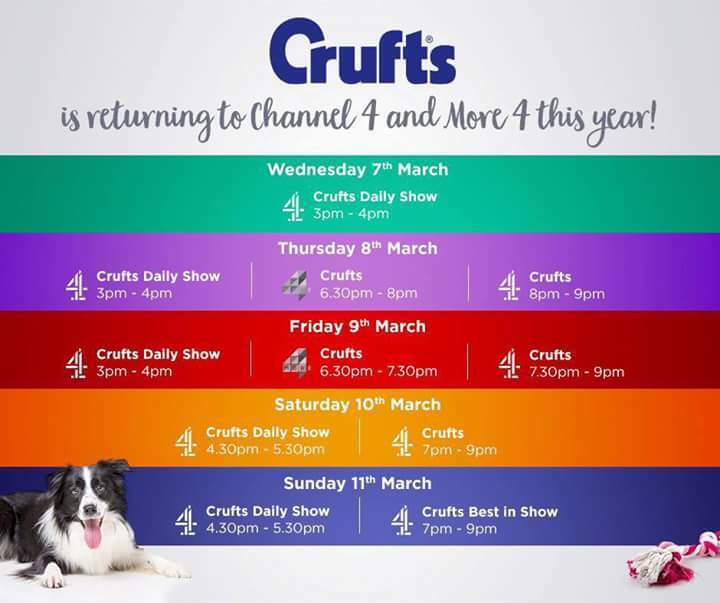 This year Channel 4 will be broadcasting an extra one-hour programme from the show in the afternoon on all four days, including a new show on the Wednesday before Crufts begins. Clare will host daily highlights of the world’s biggest dog event live from the NEC and will be joined by Alan Carr, who will be presenting the afternoon show with Clare, and Channel 4’s ‘Supervet’, Professor Noel Fitzpatrick. The presenters will be supported by vet, health and welfare expert Nick Blayney, as well as dog reporters and breed experts, Jessica Holm and Frank Kane. All of the Arena action from the show will also be shown every day live on the Crufts YouTube channel which can be found at youtube.com/crufts. Caroline Kisko, Secretary of the Kennel Club, which runs Crufts, said: “We are delighted that Channel 4 and More4 will be offering viewers at home the opportunity to enjoy even more of this year’s Crufts. The event holds such a special place in dog lovers’ hearts because it celebrates everything that we love most about dogs, and the programmes will reflect on the benefits dogs bring to our lives and the many fascinating aspects of Crufts. Channel 4 and More4’s coverage of Crufts will be produced by Sunset + Vine and Channel 4’s afternoon shows will be produced by Mentorn Media.